Growing up in New Orleans, Peyton attended Isidore Newman High School and led his team to a 34-5 record during his three seasons as a starter. He passed for 7207 yards, completing 59.4% of his passes with 92 touchdowns. 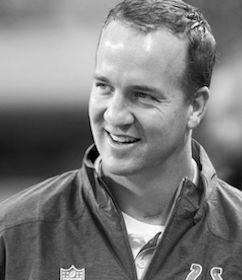 After his senior season, Peyton was named Gatorade Circle of Champions National Player of the Year and was the number one recruited quarterback in the nation. Proud to be a Tennessee Volunteer, Peyton collected honors during his tenure at UT. He became the school’s all-time leading passer with 11,201 yards, 863 completions, and 89 touchdowns. He holds 42 NCAA, SEC, and Tennessee records, including 33 Tennessee single game, season, and career records. Peyton was 39-6 as a starter for Tennessee. As a freshman, he threw three touchdowns against South Carolina. As a sophomore, Peyton recorded his first 300-yard day against Georgia. Peyton’s first 400-yard game came as a junior against Florida, and as a senior he threw his first 500-yard game against Kentucky. In 380 passing attempts as a sophomore, Peyton threw just four interceptions, an NCAA single-season record. For his career, Peyton recorded the lowest interception percentage of all time, 2.39%, a mere 33 interceptions in 1381 attempts. By the end of his junior year, Peyton had already completed his degree, a BA in speech communications, and many suspected he would enter the NFL Draft, and likely be the top pick. Peyton elected to stay at UT for his senior year. He threw for 3819 yards and 36 touchdowns in 1997 and graduated with Phi Beta Kappa honors. Peyton was elected to the GTE Academic All-American team, won the prestigious Burger King Vincent Draddy Scholar-Athlete of the Year with a $100,000 endowed scholarship to the university, and was named the Maxwell Trophy winner for college football’s best player and the winner of the Davey O’Brien and Johnny Unitas awards as the nation’s best passer. Peyton also received the illustrious Sullivan Award, presented to the nation’s top amateur athlete based on character, leadership, athletic ability, and the ideals of amateurism. Peyton Manning, the league’s only five-time MVP and a 13-time Pro Bowl selection, completed his 16th NFL season in 2013, and stands alone as the active leader in nearly every statistical passing category. Manning owns the second-most wins (154), passing touchdowns (436), completions (5,082) and attempts (7,793) by a quarterback in NFL history, while ranking third with 59,487 career passing yards. His 12 seasons throwing for more than 4,000 yards and his 14 campaigns with 25-plus touchdown passes rank first in league annals along with his 72 games with 300-plus yards and 73 contests throwing for at least three touchdowns. He set Broncos single-season records in nearly every major passing category in 2013, including completions (450), attempts (659), passing yards (5,477), quarterback rating (115.1) and an NFL Record for TD’s with 55 on the way to his record 5th MVP. During his first 14 NFL seasons with Indianapolis, he set club records in nearly every career passing mark and led the franchise to its first World Championship in 36 years, earning MVP honors in the Colts’ 29-17 win over the Chicago Bears in Super Bowl XLI.